A visual representation of the system. In reality, he would be wearing a wig and pointing towards a bailiff. The words would remain the same. For those without comedic tastes, the so-called experts at Wikipedia have an article about Three-strikes law. Three-strikes laws are statutes enacted by America states whereby after committing two crimes your third crime will, no matter how small, land you a life sentence. Although proving to be too liberal a policy for Texas to adopt, with the Lone Star State favoring the one strike law, it is a policy spread widely over America. This statue became very popular in the early 1990s when tri-offending was at its height, after careful consideration of the facts it was concluded that letting people commit two felonies was permissible but on the third they would be hammered for it. The name of the bill is such because of the occasion in which its inception was made. In 1994, on Tuesday afternoon congress posed the bill to a lethargic George H. W. Bush, for him to sign. 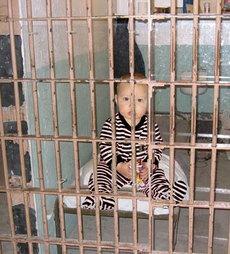 The three-strikes law is primarily to deter those who commit crimes from repeat offending. As one can see from the statistics it has been extremely successful in incarcerating those who commit petty theft, carry marijuana on them, or get a parking ticket. After the introduction of the three-strikes law prison warders began generally agreeing that their job had become at least twice as easy, as keeping someone who hasn't returned their video tape rentals three times in a row down is far easier than suppressing a murderer. The three-strikes law has on balance been a rousing success, with 25% of the world prisoners being American. 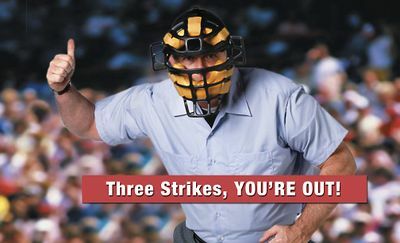 In fact, the three-strikes law has done more then fulfill its mandate, it's done overtime! There are now more black American males in prison than in college, freeing up space for intelligent white people, mostly republicans! God bless America. This poor stick-man was a vandal, a thief, and a hippie, the maximum security unit was the best place for him. The history of the three-strike law is steeped in controversy. There have been frequent incidents of namby pamby liberals screaming out that prison isn't the place for shoplifters, that a system of justice based on baseball is wrong, and that McDonald's are run by lib-tards who are fattening America up so they stand a chance in WW3. The law was first passed in Washington, then closely followed by California in large majorities. The law, at the time, was simply called Three Strikes and you're Out to make it easily understood by Americans whose native language is sports-metaphors. Incidentally, a proposed BBC game-show by the same name charting the rise and fall of those who were effects by this law was rejected on grounds that the insightful British public would find locking away rural Americans entertaining for no more than five minutes. Slowly the law began to spread to other states, but none adopted it as fervently as California, who took to the law like a dirty-old-man to an insecure teenager. In fact, in 2005, over 65% of those imprisoned under the three-strike law were non-violent offenders. And if that wasn't fulfilling enough, African-Americans sentenced in Californian on felonies avoid the slammer 48% of the time, whilst 66% of whites get an apology from the judge and a $20 coupon at TGIF. The magic of the American Dream. By 2004, twenty-six states had a three-strikes-like-law. Those locked away should not fret, because they are entitled to a parole hearing after serving only 25 years (which is 300 months or 1311 weeks or 9125 for those counting on their prison walls). There isn't much one can say in that situation, except have the judge scream Youuuu'reeee out! and slam his hammer down as a final testament to the sweet justice of America. After stealing his third cookie in a row, poor little Kevin was sentences to a lifetime behind bars. The effects of this law are widespread, there have been numerous occasions of the law working exactly as intended, and even more of it working better. Take for example the vile excuse for a human, Leandro Andrade. This man is now serving two life sentences in a Californian prison for the most heinous of crimes. He shoplifted not one video tape, not two, ah I bet you think three, no he stole 9 video tapes. All I can say is he had it coming and probably wanted to be holed up for life. Another example would be Kevin Webber, who received 26 years for stealing 4 chocolate chip cookies. These two cases raise the question: if you're down to your last chance, why not commit a spectacular crime? While committing crimes ins't cool, isn't it still better to go out with a bang than with a whimper? Nobody wants to spend 26 years of their life with murderers throwing impromptu hankering-fests for sweets next to a patisserie with no change on them. It can only lead to bad things. 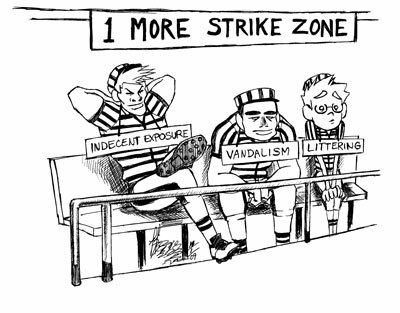 Some governments find the three-strike law too lib-tarded but still like the idea of strike-and-you're-out-justice. Now obviously this is grossly unfair to those who commit minor crimes but when considered carefully by a board of highly-trained international relations advisers, this variant of the law was found to be fit for use in all states which happen to have an African-American population that outnumbers whites. The cause for this coincidence remains uncertain. Although originally they wanted to copy the principles of the Middle East, and sever hands and even necks for merely committing acts of flatulence in public, this was rejected on grounds that disposing of the body-parts ties the system into a slow bureaucratic mess. "You can't shred the bodies like we shred all the important documents" George Bush r. was revealed to have said in a document too thick to be shredded. Due to the popularity of the three-strike law sports-terms-based-laws have taken off. Four Downs Law: if any family has more than three children with Down's in their family, they are forced to punt. 5-minute major for fighting: any Canadian immigrants found fighting on America's ice rinks must serve a 5-minute penalty. Soccer Law: any non-Latino males who profess to like soccer are permitted to engage in gay marriage. Elsewhere, current legislation that is loosely based on sports but could do with more clearly defined boundaries has been proposed. These include changing the process of presidential elections to something like a beauty pageant. This would mean fewer candidates parading around all the states and more well-shaved bodies on display. The candidates would simply dress us in sparkly sequinned robes and show the judges (the public) their greatest talent. For example, John McCain could impress Americans with his ability to bore everyone, young or old, into near death with his endless, convoluted war stories. Changes have also been suggested to American foreign policy, which already mimics one sport in particular and with one simple change would become infinitely better. Right now the similarity between American foreign policy and target shooting is uncanny. But the one change that is being suggested by congress is that instead of scoring points based on how close you are to the target, you score points based on how many targets you obliterate. It's already going that way at the moment, so a nudge in the right direction wouldn't hurt anybody. ↑ 5% of the world population is American, which proves again that Americans are awesome. ↑ This time its personal. ↑ 26 years... he should have taken 5 cookies. ↑ Mainly with white republicans. ↑ Well, not anyone who we care about! This page was last edited on 21 February 2016, at 06:21.